Many car owners will keep the same car loan in place on their vehicle until the loan is paid in full or until they trade in their vehicle. However, you may have heard that you can lower your monthly car loan payment through auto loan refinancing efforts. The fact is that many people actually can refinance their car loan today to find savings through a reduced monthly payment. However, some are not pursuing this option because they don’t believe they can afford to. With a closer look at what is involved in refinancing a car loan, you may learn that you actually can afford to refinance your car loan. Regardless of whether you apply for a home mortgage, an unsecured personal loan or a car loan, most lenders will charge loan fees with a new loan. Some will charge an up-front fee when you apply, but others will not charge fees unless you actually qualify for the loan and sign on the dotted line. In most cases, the cost of refinancing your car loan will be nominal and these costs typically can be rolled into your new loan. This means that most likely you will not need to come up with any money out-of-pocket in order to refinance your loan. Some people put down a rather large down payment when they bought their vehicle. Others, however, may have financed the entire cost of their vehicle purchase. Still others may have been upside down on their previous vehicle, and they may have rolled some of the amount owed on their last vehicle into their new vehicle loan. When refinancing your auto loan today, your current loan amount owed will need to be reviewed. While some lenders may be willing to finance 100 percent or more of the sales price on a vehicle purchase, most lenders will not provide financing for 100 percent of the current value of the vehicle on a refinance loan. You may consider talking to a direct car lender today to determine the loan amount you qualify for, and you can compare this figure against the amount of money you owe on your vehicle. In most cases, a car owner who has been making monthly payments on a car loan for a year or longer will be able to refinance the full amount owed on their vehicle. If not, however, you can consider waiting a few months to pay down your auto loan balance further before refinancing. Most people will be able to qualify for an auto refinance loan, and most will not have to pay any money out of their own pocket to do so. 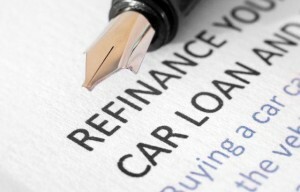 Further, the savings associated with refinancing a car loan can be significant. Take time today to use an online auto loan calculator to explore the savings possibilities in more detail, and consider getting a full quote from an auto lender. With the monthly savings available to you through refinancing your car loan, your financial situation may benefit significantly through your refinancing efforts. Some people are concerned about the costs associated with refinancing. However, because the costs of refinancing an auto loan are typically rolled into the loan and the resulting monthly payment is usually lower than what you are paying today, refinancing your auto loan may be a smart move to make.